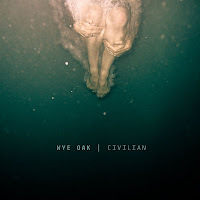 The background noise of distant murmurs in the introduction of "Two Small Deaths" is a good representation of the love that indie-rock duo Wye Oak express toward the concept of noise and the different transitions of sounds found in their new record, Civilian. As the indiscernible shuffle of talking fades into gentle guitar work and pristine vocal work, both provided by Jenn Wasner, you have found yourself entering the pit of beauty that is Civilian. Wye Oak’s second full length release on Merge Records, Civilian, is a crooning beast of gentle indie instrumentation that predominately focuses on building to crescendos that Wye Oak intelligently decide never to capitalize on. Songs such as the title track often build speed and momentum in their climb, but are released not in the typical fashion of a sonic explosion, but rather reach their climax in the form of the noisy and distorted guitar work of Wasner’s before suddenly leveling out to a gentler sound again. The duo experiments with this rising climb and sudden, gentle fall often; the hazy beat of "Plains" over Wasner’s solemnly gentle vocals tumbles into an increasingly louder sound before easing once again into the smooth drum work of Andy Stack. Similarly to a child learning how to walk, the duo collects the build and energy slowly before eventually tumbling playfully and gleefully to their familiar noise level. The balance between Wye Oak’s outbursts of noise and their softer work is a fine line that the duo toe intelligently, making the soothing choice of musicianship that shapes Civilian to be such a dreamy record to enjoy. However, do not let dreamy become substituted with the idea of being soporific, as Civilian may be a relaxed experienced but isn't without its moments of awe. The crooning within "Holy Holy" is the finest performance of Wasner’s voice found on Civilian, and it's an early favorite of mine this year just from her soothing tones. For any listener that still might harbor worries of sleep-inducing qualities of Civilian, the ho-hum sensibility of Andy Clark’s instrumentation in "Dog Eyes" is thrillingly catchy, and perfectly interrupted with more of Wasner's endearingly jarring guitar work. While Civilian never moved me lyrically, the album is so audibly pleasing that listeners will not consider it a missed opportunity. For every lyrical misstep, there is another moment of listening pleasure waiting around the corner to enjoy. Each song doesn't propel the listener as much as it guides them through Wye Oak's twisting love of noise and grace, as every outburst of distortion is appropriately balanced by a reprieve of pleasingly soft indie-rock. For fitting comparisons, the lovers of Land of Talk or Angus & Julia Stone's last albums will find plenty to love in Civilian’s familiar affection for simplistic, beautiful sound. A dreamy piece fit perfectly for the upcoming breezy and cloudless months of spring, Civilian should not be missed.